FCC believes children hold a certain special place in the heart of God. Jesus said to let the children come to him, and we at FCC create spaces where children can experience the Love of God and get close to Jesus. Each age group has certain developmental needs and we try to tailor our programs to the needs of the age group your child falls into. We are also committed to creating a warm and loving space where you child can learn and grow in faith. Meeting from 9:50-10:40am each week, we offer Sunday School classes for all ages. Each class follows age appropriate curriculum which helps your youth or child grow in faith and learn to share God’s Love. We end each session by singing songs of the faith together. Midweek Miracles is our Wednesday night children's program for all ages. This year we have a group in the Nursery for infants to 2 years old too! Each week, preschoolers through kids in 5th grade will follow mentors in a meal, songs, Bible story, crafts, and journaling. M&M runs each Wednesday from 5:45 - 7:30 pm. Our 2nd semester starts on January 16th. This Spring we will break on March 6th for Ash Wednesday and April 17th for Holy Week. 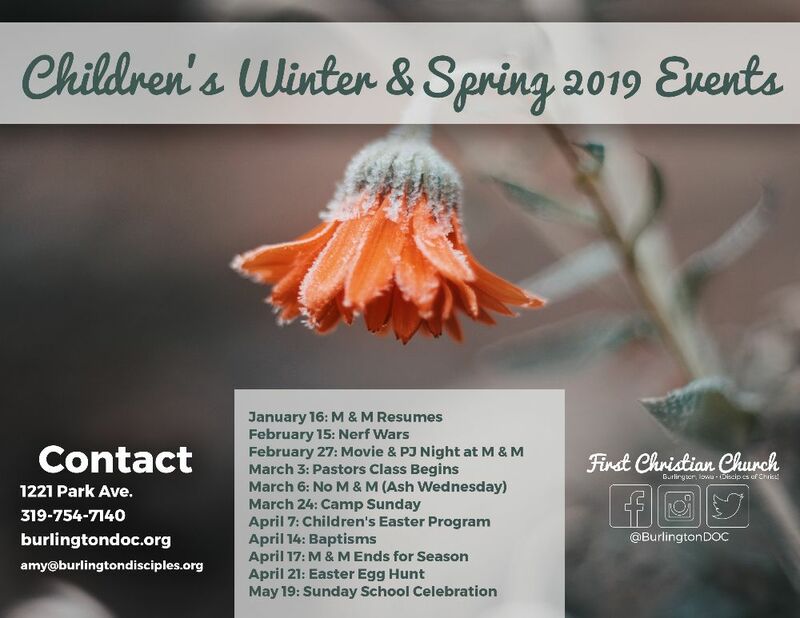 Taking place in each of our worship service, 8:45 & 10:45am, children aged 3 to around 2nd grade are invited to Children’s Church, a worship service designed just for them. Following the familiar four-fold pattern of worship (gathering, word, table, sending), they sing songs, pray, hear one of God's special stories, wonder about what they heard, respond in a variety of ways, have a feast together, and then are sent with a special benediction. Children will be invited to participate in “big worship” each 5th Sunday of the month. Each Summer, FCC hosts a week-long Vacation Bible School (VBS) for both the children who call FCC home and those children who do not. We focus on a particular theme for exploring the Bible in age appropriate ways. There is worship, singing, acting, playing, crafts, story-time, and even mission! VBS is a wonderful chance for your child to spend a week in the Summer growing in faith and sharing God’s love with other children and adults alike!